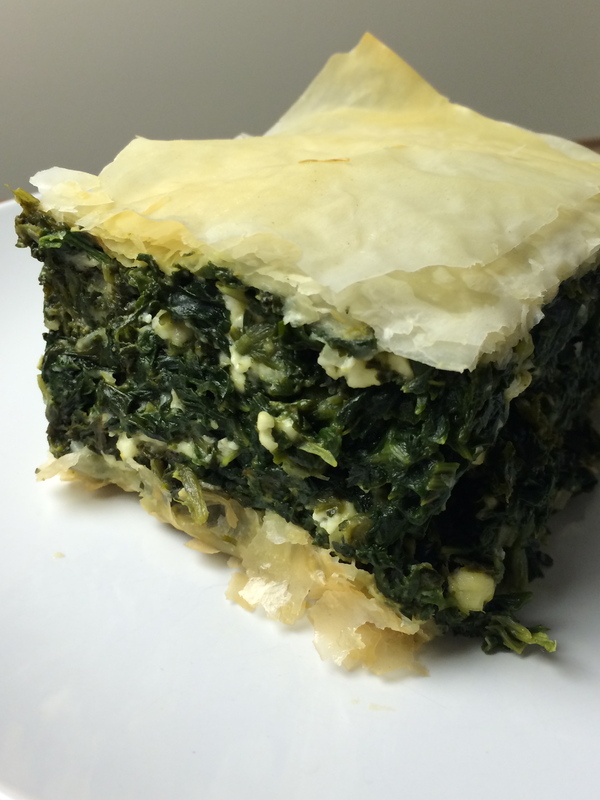 Spanakopita (aka Spinach Pie) – Who am I to argue with Hippocrates? It’s another one of those days where I realize I am not getting nearly as many vegetables in my diet as I would like. Perhaps it’s due to the fact that Faye is in the middle of a growth spurt as it feels as if every drop of nutrition and moisture is being pulled from my body. To combat this feeling, I, of course, turn to the Greeks. After giving birth to Faye I was severely anemic. I couldn’t move after delivery for multiple hours as my hemoglobin dropped to a 6 and I needed two transfusions to get to a mere 8. Spinach and steak became my very close friends for the months that followed. Maybe too close. We started ordering spanakopita from the Greek place down the street close to three times a week. At $10 a plate, (plus two $4 Greek frappe because we needed those), our spinach obsession began to weigh on our wallets. I knew if Faye ever had any hope of a college fund I had to start making it at home. The first time I prepared this dish I used fresh spinach. The second time I knew better, used frozen, and cut the prep time down by an entire hour. There was no loss of flavor. Grab a large pot and start cooking your spinach over medium heat to get out the water. Add 1 tsp of salt when your spinach is hot and stir. Cook another 2 minutes to make sure the excess water has evaporated. If you remember the night before or the morning of making this dish, take out the bags of spinach and let them thaw in the fridge. Prior to putting them in the pot, cut off a top corner of the bag, press and hold the spinach at the bottom of the bag, and while over the sink turn the bag upside down and squeeze the water out. If you just purchased your spinach or had other things on your mind prior to making this dish, then throw it frozen straight into the pot to cook the water out 2lbs at a time. Put the first batch of cooked spinach off to the side in a large bowl while cooking the second batch. Put the cooked spinach off to the side in a large bowl. Add olive oil to the empty spinach pot and heat on medium. Add green onions and saute until soft (about 3 minutes). Decrease the heat to low, add the parsley, spinach, salt, and pepper, stir and cook for another 2 minutes. Scoop the spinach mixture back into the large pot and stick it in the fridge to cool, stirring occasionally to let the trapped heat out. Preheat the oven to 350. While the spinach is cooling, put a stick of butter up to melt in a small pot over low heat. Turn off the heat when it has finished melting. Grease a 9×9 pan with some of the melted butter. Unroll the filo dough on a flat surface and cover with damp paper towels to keep moist while working. 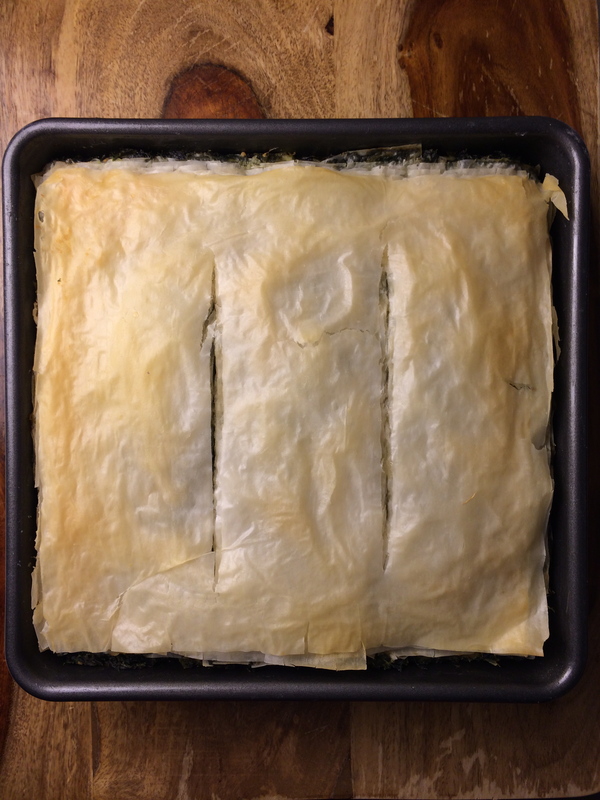 Place 6 sheets of filo on the bottom of the 9×9 pan, brushing each with butter as you go. (If you do not have a brush, use a balled up paper towel. It will work just as well and then you don’t have to clean a buttered up brush.) Spoon in your spinach feta mixture overtop and flatten. Top with 6 more sheets of filo, brushing each with butter as you go. Make a long incision (about 1” from the top to 1” to the bottom) through the top 4 sheets of filo. Bake for 45 minutes or until top is golden. Let sit for 10-15 minutes before cutting and serving.